I am super excited to be kicking off this new series soon! 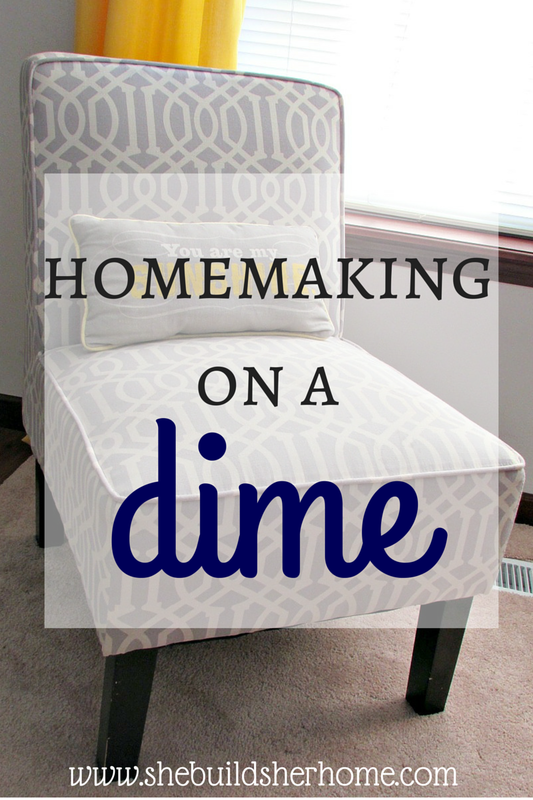 This series, Homemaking on a Dime, was actually one of the very first ideas I had when I started this blog, but I just haven't ever gotten around to writing it...until now! I will be including lots of ideas in each post of how to do all of these things when money is tight! Ever since we moved into our new home and downsized last April, I have been working on creating a warm and cozy, welcoming home for my family and friends and I've had to get creative sometimes with how to do it on the cheap. Even if you're not looking to decorate a new home, or you're not on a tight budget, I still hope that you will find a lot of these ideas helpful and inspiring! If you have any ideas or tips that fall into any of these categories that the world needs to know, send them my way and I will be sure to include them. Otherwise, I'm looking forward to kicking off part 1 next week!